In natural environments with diurnal and/or seasonal temperature changes, temperature is one of the main relevant environmental variables that microorganisms, including yeast species, have to deal with. Temperature is also a key factor in some industrial processes involving microorganisms. Low temperatures (10-15°C) are used in wine fermentations to enhance production and to retain flavor volatiles. In this way, white and “rosé” wines of greater aromatic complexity can be achieved [1, 2]. Yeast undergoes considerable stress during wine fermentation due to the high concentrations of sugars in grape must, which leads to high osmotic pressure at the beginning of the process. Then as fermentation proceeds, ethanol accumulation, limiting nitrogen concentration, or even presence of SO2, imposes further pressure on wine yeast. Therefore to these difficulties, which are inherent to the process, we should add a sub-optimal temperature for the primary fermentation agent. Temperatures below its optimum range for growth, around 32°C , affect both the yeast growth and fermentation rates, and give rise to not only a prolonged lag phase, but also to the production of stuck and sluggish fermentations . Low temperature has several effects on biochemical and physiological properties in yeast cells: poorly efficient protein translation; low fluidity membrane; changes in lipid composition; slow protein folding; stabilization of mRNA secondary structures; reduced enzymatic activities [5–8]. These problems can be avoided by providing better-adapted yeasts to ferment at low temperature. In past years, some attempts have been made to elucidate the response to cold in Saccharomyces cerevisiae through a variety of high-throughput methodologies. 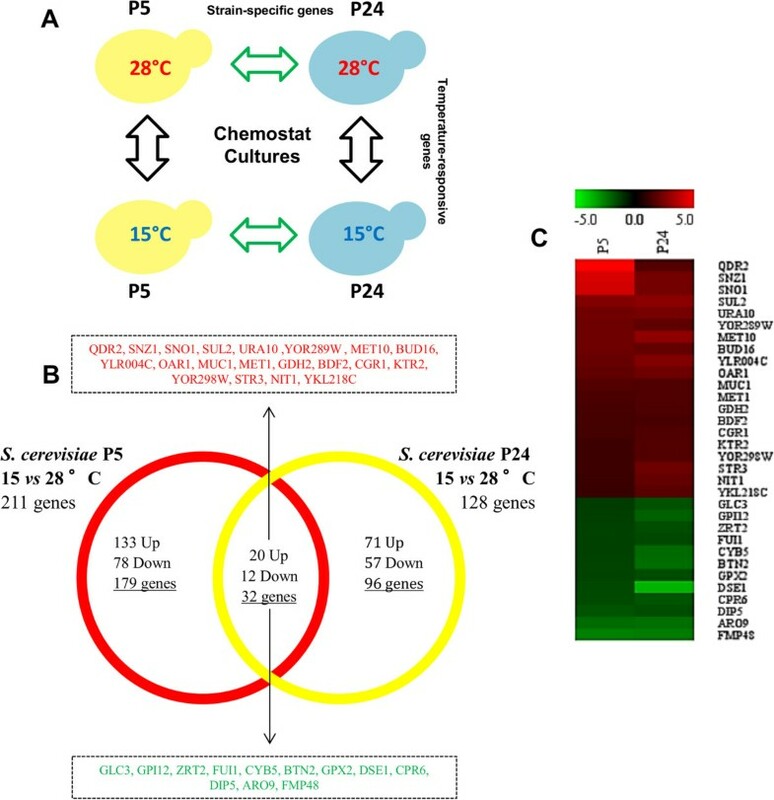 Some studies have analyzed the genome-wide transcriptional response of S. cerevisiae to low temperatures. These studies have focused mainly on cold shock [6, 7, 9, 10]. Schade et al. 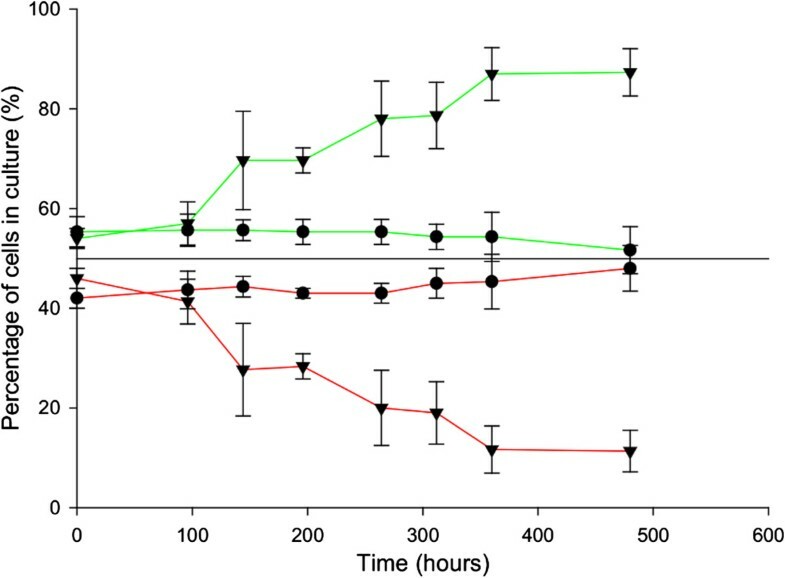 identified two distinct phases in the cold shock response: 1) an early cold response (ECR) occurring within the first 12 h after exposure to low temperature; 2) a late cold response (LCR) taking place beyond 12 h after exposure to low temperature. An ECR induces the genes implicated in RNA and lipid metabolism, whereas the genes induced during an LCR encode mainly the proteins involved in protecting the cell against a variety of stresses. In fact, the LCR response is very similar to the general stress response mediated by the transcription factors Msn2p/Msn4p. However, the response type depends on the duration of exposure to stressful conditions. Sudden exposure to environmental changes (e.g., cold shock) is likely to trigger a rapid, highly dynamic stress response (adaptation). Prolonged exposure to nonlethal stimuli leads to acclimation; i.e., establishment of a physiological state in which regulatory mechanisms, like gene expression, fully adapt to suboptimal environmental conditions . Tai et al. compared their transcriptomic results obtained during cold acclimation in a steady-state chemostat culture with other previous genome-wide transcriptional studies of batch cultures at low temperature, and found major discrepancies among low-temperature transcriptome datasets. These authors partially explained these major differences by the cultivation method used in different transcriptome experiments. Although batch cultures are well-suited to study low temperature adaptation dynamics, they are poorly adapted to study prolonged exposure to low temperature. 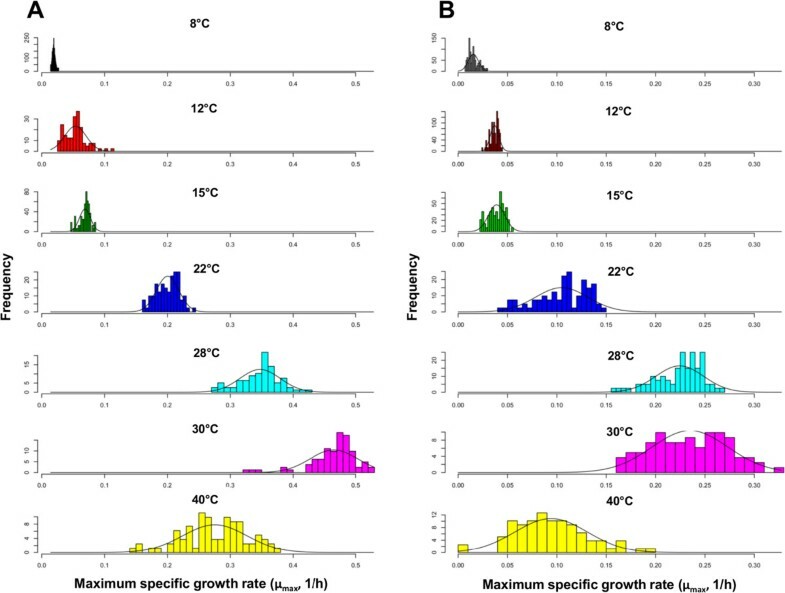 In such cultures, the specific growth rate (μ) is strongly affected by temperature, which makes it impossible to dissect temperature effects on transcription from specific growth rate effects. 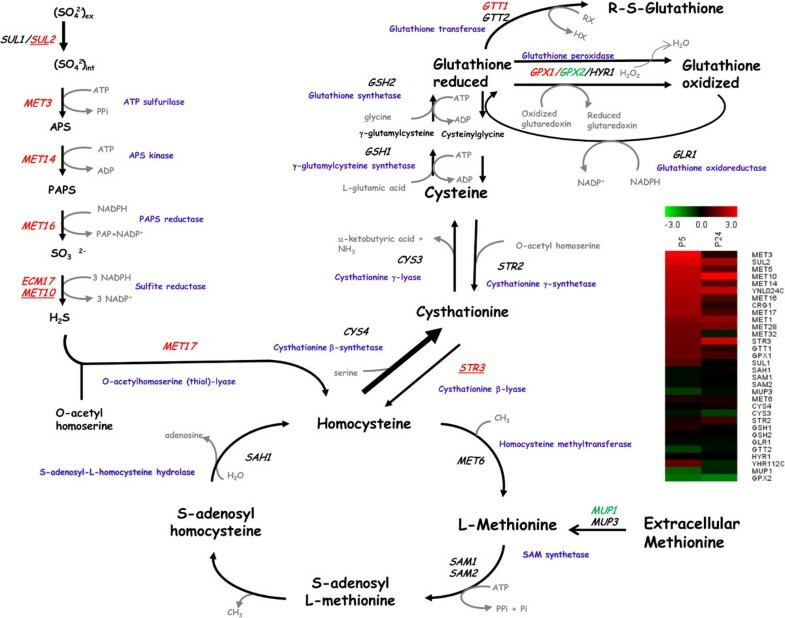 Two recent chemostat studies [11, 12] also found that the growth rate itself has a strong effect on transcriptional activity. Furthermore, chemostat cultures help to accurately control the specific growth rate, so the concentration of all the metabolites is constant over time, thus providing a good platform to study microbial physiology, proteome profiles and gene expression . Several works have shown the marked importance of temperature on the growth of wine yeasts [28–31] and the influence of this environmental factor on determining the natural distribution of wild species . A direct effect of lowering temperature is to slow down the metabolic activity of yeast cells, which accounts for reduced growth and longer fermentation processes . Thus, unraveling the molecular and physiological mechanisms that allow better adaptation and growth at low temperature is interesting. 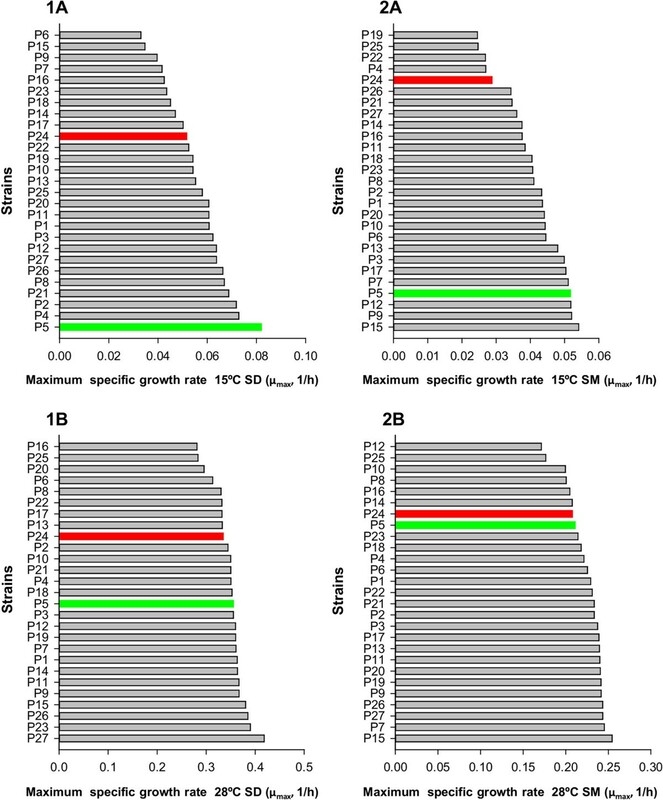 In this study we followed a global approach by comparing transcriptomic, proteomic and genomic changes in two commercial wine strains, which were selected as having clear differences in their growth and fermentation capacity at low temperature. The selection of these strains was based on the maximum growth rate in a synthetic grape must (SM) during miniaturized batch cultures at different temperatures. The fitness differences of the selected strains were corroborated by directly competing during fermentations at optimum and low temperature. These competition experiments highlighted the better competitiveness of P5 vs. P24 only at low temperature.